GBA Wario Land 4 (USA/Europe) in 40:04.88 by andymac. Arguably better known these days for the WarioWare series, our anti-hero Wario started off as the villain in Super Mario Land 2 before starring in his own series of platformers of which this is the fifth (everyone forgets Virtual Boy Wario Land). 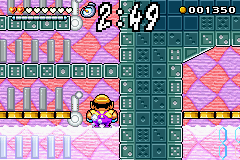 Through strategic use of save-and-restore and a glitch allowing rapid diagonal movement and zipping, Wario gets away with all the loot in this Hard mode run (the hardest difficulty available from the outset) 22:30.68 faster than before.